Antique Oil Lamp c1900. Without globe so sold as scene. Dispatched with Royal Mail 2nd Class. A WONDERFUL 19TH VASELINE URANIUM GLASS OIL LAMP. MATCHING SHADE AND RESERVOIR GLOWING BEAUTIFULLY AS YOU CAN SEE IN PICTURE. HEIGHT OF SHADE - 6.5 INS OR 16.5 CM. HEIGHT FROM BASE TO TOP OF CHIMNEY - 23.5 INS OR 59.5 CM. Very nice antique cranberry double ring faceted font, about 6” high over 6” dia. The burner screws into a brass collar, set in a pretty blue moulded opaline glass font or bowl, which seems a bit lighter towards the bottom. This rests in a solid brass reeded column which has an ornate carved round foot on a black glazed pottery base. (at widest point). ~ GOOD~LUCK ~. HEIGHT:~ 6". (including collar & undermount). FOR SALE HERE IS THIS LARGEANTIQUE VASELINE GLASS / URANIUM GLASS SHADE WITH A RUFFLED RIM. THE SHADE HAS A SWIRL DESIGN AND ,AN UNUSUAL, TALL SHAPE. IT IS IN OVERALL EXCELLENT ANTIQUE CONDITION. This Victorian Cranberry Teardrop Design Oil Lamp is approx 30" Tall. The Lamp with twin Burner, an oval glass chimney and t o complete this beautiful Lamp is a fine Quality matching Victorian Period Beautifully etched Matching Cranberry Shade (12 edged ). 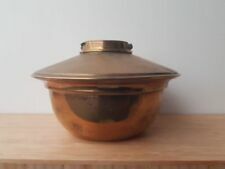 Victorian Hinks Gallery Lift Oil Lamp Duplex Burner - On Copper Font/reservoir. Very old hand oil lamp in good condition ,just very dirty. The glass chimney is good No cracks and a good fit. The holder is good all crown bits in place. The wick winder goes up and down ok. Handle is good . No dents on the body ,No holes . With chimney in place 10 inches tall. Very nice antique etched oil lamp shade, about 7” tall with 4” fitting rim. It is in very good condition just a small chip to outside edge of fitting rim, see picture, could do with a clean some decorating dots of paint scattered about, please see my other auctions for a very nice cranberry font, thank you. Victorian Vaseline chimney. Approx sizes; Top hole 1" dia. bottom 1 1/4" o/dia. 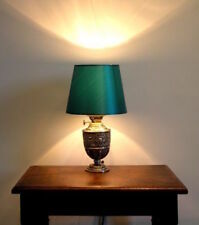 A Genuine Victorian Oil Lamp in the beautiful Green Design with Matching. This is a stunning, original, large Hinks Oil lamp. The Hinks No. 2 burner has been thoroughly cleaned and polished and is in excellent condition and working order. The Corinthian base is very solid (the final photo gives an indication of the thickness of the brass) and stands at an impressive 36.5cm and 14.7cm square at the base. A BEAUTIFUL RARE CRANBERRY/CLEAR ETCH VICTORIAN TWIN DUPLEX OIL LAMP SHADE. 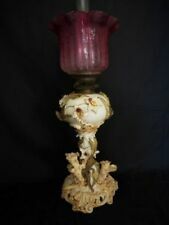 VICTORIAN EDWARDIAN ART NOUVEAU DUPLEX DOUBLE WICK OIL LAMP. COMPLETE WITH GLASS CHIMNEY AND ETCHED TULIP SHADE. 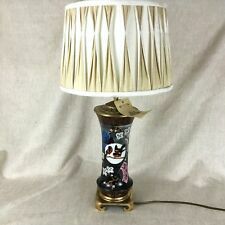 LOVELY OLD LAMP. CLEAR GLASS FONT WITH BLACK STONE BASE AND BRASS STAND. Condition: I have made no attempt to clean or polish this lamp and there are marks and tarnishing to the item. The font has been drilled (has a hole in it) to the underside so will not hold oil. The burner has been electrified in the past but there is no bulb holder. A very pretty, glass, floral oil lamp complete with round, single burner and shade, giving a soft, steady and economical light. The flat wick is wound into the round burner. The cut brass decoration on the shade ring is fragile and has been reinforced with adhesive; however, it is not essential to keep the shade fitting in place as this is achieved adequately by the ring. This lamp is delicate enough to make an attractive, dining centre piece. Total height 23 cm. EXCELLENT OIL LAMP SHADE, DEPICTS A BEAUTIFULLY ETCHED POOL WITH REEDS AND STORKS/CRANES FISHING. Top of Chimney 385 mm. A brass adjusting joint is fitted to the base of the swan neck, enabling the shade to be tilted as required. Various component parts have been replaced where necessary to bring the lamp up to 21st century standards. VICTORIAN RIBBED ROUND ETCHED GLASS OIL LAMP SHADE 4" base. Victorian internally ribbed acid etched clear glass oil lamp shade for 4" shade gallery. 2x duplex oil lamp glass chimneys. Dispatched with Hermes signed for , approx 10 inches tall, one perfect , the one marked griffon has two small chips on base , please see pictures.both chimneys are oval bulge. A SUPERB ETCH ROSE PINK VICTORIAN TWIN DUPLEX OIL LAMP SHADE. A superb quality Rose Pink etch Victorian Art Nouveau/Victorian shade with a beautiful fine detailed floral etch pattern a lovely oil lamp shade the size is 6.1/2" tall x 4" twin duplex carrier fit with a beautiful large 8.3/8" wide crimped open bell top. The marble is a sepia-red veined on a grey white background. Small area of loss in one of the red parts where a flat eye has dropped out, can be felt but is not noticeable ( shown in picture 3 just under 1/2 way up. ). 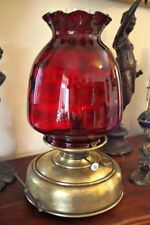 Antique Oil Lamp With Cranberry Glass Font & Shade, Glass Chimney and Brass Corinthian Column Base. Shade has a few small areas where the colour has been rubbed but overall in good condition for its age. Overall height 27 inches. MADE BY HINKS. A GOOD QUALITY REEDED BRASS COLUMN OIL LAMP BASE. 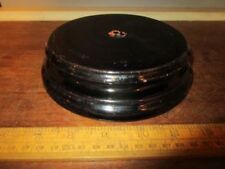 THE BASE IS 5 1/2" X 5 1/2". The fixing is marked with the letters UMWDGC. MARKS- S. CLARKE FAIRY PATENT TRADEMARK MOULDED IN THE HOLDER AND THE BASE. This is a beautiful and original Victorian Vaseline lamp shade. Support the British Heart Foundation's life saving research. Dust, wear and tarnishing visible throughout. In acceptable condition for age. 12 x 9cm (Length x Width). Approximate Weight - approx. This is in excellent condition and full working order. This has been rewired to modern standards. It takes a bayonet bulb. The lamp is a Corinthian column shape, which is black, that stands on a brass, tiered, square base. The base is heavily stamped with a cast iron weight inside. The whole thing weighs a little under under 2kg. As you can see in the pictures it is clean and free from major dents. There are a few small dents in the base, to corners, not particularly obvious, from years of use, there are NO holes or worn through corners. This is a beautiful original antique Vaseline oil lamp shade. They look very like the work of Benson and other Arts & Crafts makers. Clean but not recently polished, have wax residue inside. The surface finish is a coppery colour with remains of a lacquered finish. VICTORIAN ETCHED CRANBERRY SHADE WITH PEACH / ORANGE FONT + GOLD BASE OIL LAMP. WITH CRANBERRY ETCHED GLASS SHADE. AND A LOVELY PEACH / ORANGE FONT. A VERY NICE TWIN BURNER ART NOUVEAU TABLE OIL LAMP. Antiq Pink Glass Embossed Oil Lamp & Etched Glass Shade. Wright & Butler Burner. Antique pink glass oil lamp with etched pink glass shade. Wright & Butler burner. There is a bruise to the shade see second to last photo. Beautiful Antique French Limoges Hand Painted Porcelain Vase Lamp, Marked.